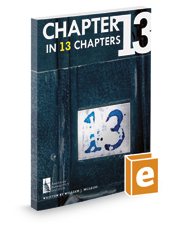 Chapter 13 in 13 Chapters provides a comprehensive overview of the chapter 13 process from the perspective of both debtors and creditors. Everything from filing preparation and debtor education to the role of the chapter 13 trustee to the discharge of debts is covered, as well as things to consider before a case is converted and when to modify the terms of a payment plan. Written by William J. McLeod and edited by M. Regina Thomas, the manual provides sage advice for the chapter 13 attorney regarding the timing of the debtor's tax filings, anticipating and addressing a debtor's change in circumstances postconfirmation, enforcing the debtor's rights against a creditor's collection activity, and postdischarge actions. Heavily peppered with case citations and key excerpts from relevant sections of the Bankruptcy Code, Chapter 13 in 13 Chapters is the essential reference guide that chapter 13 attorneys should have at their fingertips to assist in their practice and to share with clients to help explain the bankruptcy process.